Sadly, there are no graphs of my own in this post, only references to other people’s great resources. In my last two posts I plotted pretty graphs that show a stagnation in domestic box-office and a crash in DVD sales. That was a pretty sad picture of the industry. But it was only a partial picture. “Home entertainment” is not only DVDs. It’s BlueRay and it’s rentals and it’s video streaming services too. The first two are most likely attached to the general crash in what the industry calls “packaged video goods”. Here is an eye opening article from the Wall Street Journal (need to subscribe to read), which quotes a report by the Digital Entertainment Group – you can get the exact numbers there, but the bottom line is that packaged video will not save the day. It’s streaming that is the new hope. Be sure to take a look at this publicly available beautiful chart the WSJ has on their website. According to it, the growth in movie streaming has finally caught up with the crash in DVD sales. 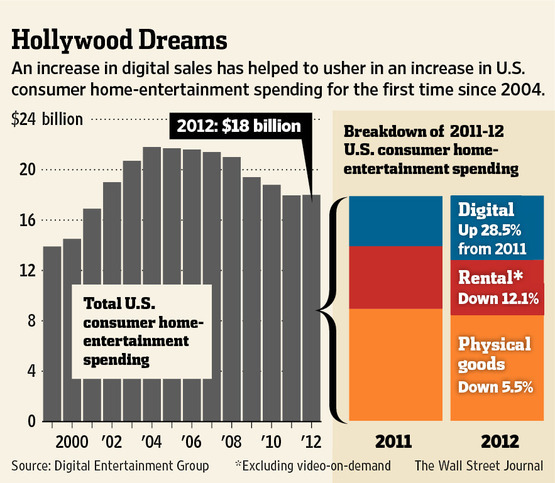 The result is the first increase in home entertainment sales since 2004 – stabilizing around $18B. An increase in home entertainment! That is huge news. While most people are obsessed with box-office, they forget about this huge portion of the film industry. So. If we combine the stagnation in domestic box office shown in my previous post, with the crash in DVD sales shown in another post, it may seem like the industry is heading towards its end. But when we add to that the amazing rise of online movie streaming services, a glimmer of hope appears on the horizon. Embrace online streaming services as the new distributors: fighting Netflix is like mistaking a fire-fighter for a burglar and shooting him while he tries to tell you your house is burning around you. Get on the international sales wave, as shown in one of my previous posts.